✓ The best local, regional and national news in sports, politics, business and more! If you have any questions or need further assistance, please call our customer service team at (315) 789-3333 or email circulation@fltimes.com. Cloudy skies. Slight chance of a rain shower. High 59F. Winds NW at 5 to 10 mph.. Partly cloudy skies. Low 43F. Winds light and variable. Cairn were used by the earliest human beings to mark the way across wilderness, to indicate a buried cache of food or water, an astronomic marker denoting time, or where someone is buried. Today, hiking in the Adirondacks or on an island in Maine, a little pile of rocks offers reassurance that I haven’t wandered off the path, and each time I see one, a small grin of gratitude wells up within me for whoever stacked them. Cairn pre-date altars. In ancient times, before there were elaborate temples and institutions of religion, when human beings encountered God or an agent of holiness, cairn were used to mark the epiphany. Gods were deities of place in those days, and cairn would have been the first altar marking a spot as holy, warning those who might stumble onto it to take off their sandals. Archeology used to presume that religion followed agriculture, developing where cadres of people settled to farm. But it has now been demonstrated that sacred places like Stonehenge, and the more ancient Gobekli Tepe in modern day Turkey, attracted agricultural settlement after it was first marked and traversed as a sacred place. In other words, religion in the form of sacred places formed agriculture and civilization as well as the other way around. St. Peter’s Basilica, the Dome of the Rock, Hagia Sophia, Saint-Michel d’Aiguilhe, and Shwedagon Pagoda, are simply elaborate cairn. Being the host of a sacred place that is preparing for adaptive re-use, where every part of the building except the chancel and altar would be decommissioned as a church to become an inn, I often hear those who are not members express sadness at the loss of another architecturally significant church. 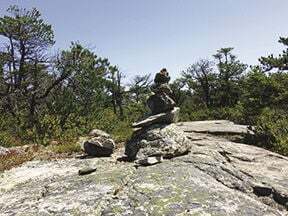 I wish I had a magic wand that would allow such people to see the vast canvass of time and the evolution of cairn along the way, and what a blessing it is to be able to preserve both the architecture for public use, and the sacred space for prayer and epiphany. Cathedrals were first built and functioned as community centers for all the activities of vast agricultural lands and villages surrounding them, not only for worship. St. John the Divine in New York City, the largest cathedral in the world (and also Episcopal), has hosted live circus shows with elephants et al, Paul Winter solstice concerts, poetry slams, and teenage sleep overs. It is a familiar evolution of civilization growing up around a sacred place, and the two living well together. Trinity Church in Geneva, and likewise St. Francis and St. Stephen’s, or Mt. Olive Baptist and Temple Beth-el, are cairn. They are marked by the people who have come before us, as sacred places in which epiphanies have taken place. As a result, community has grown up around them. Cameron Miller is the author of the spiritual fiction “The Stream Room Diaries” and numerous published poems and is publisher of www.subversivepreacher.org. He lives and writes in Geneva and serves as the priest of Trinity Episcopal Church. He can be reached at dspiritflt@gmail.com. Our daily headlines delivered to your inbox at noon each day for your reading pleasure. Receive news and emergency updates as soon as the stories unfold. What is your favorite team name in this year’s Seneca7 relay race? Four Score and Three Years to Go! Cloudy skies. Slight chance of a rain shower. High 59F. Winds NW at 5 to 10 mph. Partly cloudy skies. High 62F. Winds NNW at 5 to 10 mph. Finger Lakes Construction Co., Inc.